Sal Khan, founder of the Khan Academy, sits in the main room of his laboratory school in Silicon Valley. 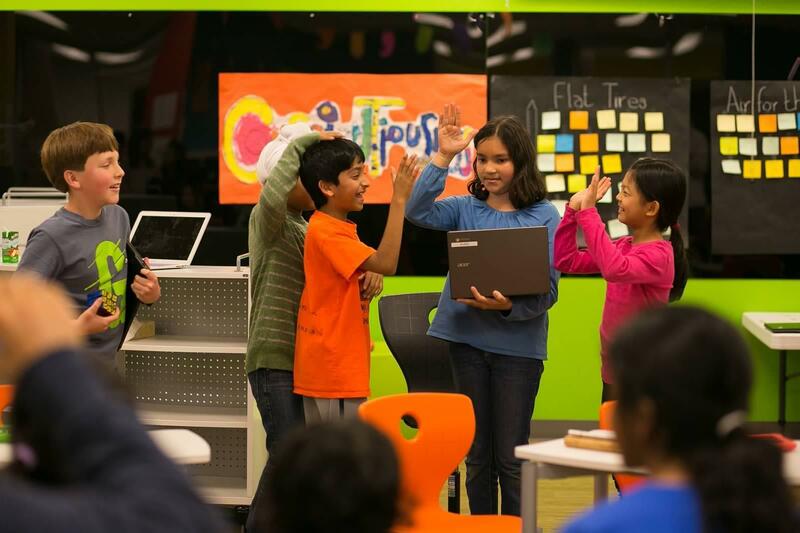 Students high-five and share a laugh. 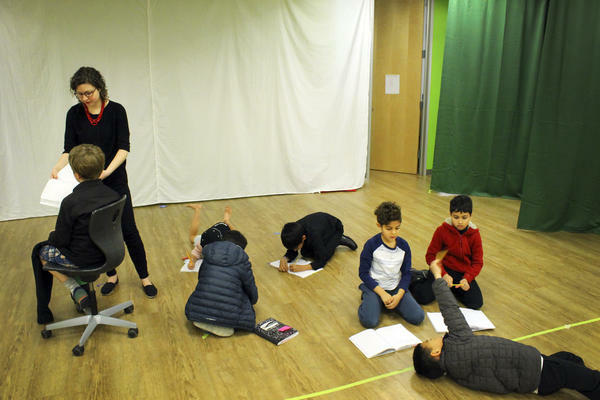 Students rehearse a play at the Khan lab school. Students sketch, paint and write out their ideas on one large sheet of paper. 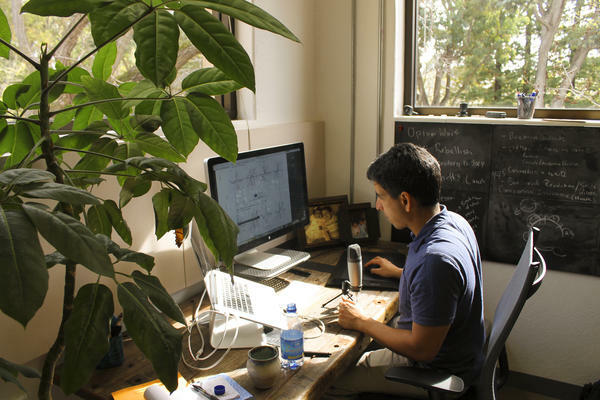 Sal Khan works at his office in Mountain View, Calif. He still starts the day making video tutorials, which he's done for a decade, for his online academy. After some 10,000 online tutorials in 10 years, Sal Khan still starts most days at his office desk in Silicon Valley, recording himself solving math problems for his Khan Academy YouTube channel. "OK, let F of X equal A times X to the N plus," he says cheerfully as he begins his latest. Khan Academy has helped millions of people around the world — perhaps hundreds of millions — learn math, science and other subjects for free. But these days, just one flight of stairs down from his office, there is a real school that couldn't be more different in form and structure from those online lectures. Most Fridays, the lunch option includes a Socratic dialogue with Khan himself on a wide range of issues, ideas and trends. "So the last couple of seminars we've been talking about technologies that will potentially change the world," the 39-year-old Louisiana native tells the students. "We did self-driving cars, virtual reality; we talked about life extension, and robots." He's sitting on a picnic table with a small group of seventh- and eighth-graders, who are nibbling on their lunches. The seminar topic when I visited? The prospects and perils of artificial intelligence. "What is artificial intelligence?" he asks. "How would you know something can think the same as a human being?" Khan asks. They debate the ethics and delve deep into the anxieties of artificial intelligence. "How do you know that it will listen to you?" a female student asks. "If it's a human brain, sometimes I don't listen when people tell me to do things and sometimes I make bad decisions. And this could make 10 times worse decisions!" The discussion is quintessential Silicon Valley: self-referential veering toward self-important. Yet it's compelling, engaging — and genuinely different. "Why can't you have an AI that is, like, completely peaceful and has no ego?" Khan asks the group, adding, "Do you think intelligence and ego is correlated?" "If we eliminate all our bias and ego, I mean, I have some ego!" another female student replies, chuckling. Just another lunch chat at the Khan lab school. Inside, there's a big, open classroom. The school's ethos of playful, student-driven inquiry gives it a Montessori-meets-Willy Wonka feel. The kindergarten through eighth-grade school currently serves some 65 students. There are no grades or grade levels; there's no traditional homework. Students are organized by independence level, with all ages mixed together much of the day. The students shape their own schedules, craft attainable daily and term goals, and help direct how the place is run. In one area, students talk politics while drawing flags and maps on poster board. Elsewhere, students are rehearsing a play version of Shrek. I wander into an adjacent room and find 8-year-old Ben writing quietly in his journal, sitting comfortably in a beanbag chair. Should I read an entry to you? Ben asks. "This one was: what I wish we would have more of. I hope we have field trips. I have more entries, but I don't want to share them." That's cool. It's your journal. I understand. "What do you like about your school?" "That you can move at your own pace," he tells me. "You don't have to be with everybody else." We're not using students' last names here at the request of the school. A growing number of schools make personalized learning — a student working at his or her own pace — part of the curriculum. But the experiment here, in many ways, is how to make "personalized learning" into more than a nice slogan. Here, personalized exploration is built into every school day. The students I talked to love it. "We get to take responsibility of what we want to do and where we wanna dive deeper," says 10-year-old Gurshan. "That's an opportunity we didn't really have at other schools. Here we're free to discover what we like. So I spend at least half an hour every day coding. I do Java script. And I'm just starting to learn Python." Most teachers, too, have embraced the creative freedom of the lab school. Mikki McMillion holds the title Lead Advisor. "That means you advise a group of kids," she says, a task well beyond a focus on curriculum and lessons. "We support and coach and advise their academic, social, personal progress." McMillion taught English for many years at a public high school. Eventually, she says, she felt walled in and frustrated as she saw her students become ever more grade-obsessed. "Because of that, they will do things like not read books anymore. They'll only read the SparkNotes. I once had a freshman student tell me that, to succeed at our school, you had to lose your soul. I just thought: Oh, wow. That's painful, but I see why he's saying that." But at this school, she says, she's been able to return to what drew her to teaching in the first place: helping students cultivate their interests and passions. "I can honestly say I know these kids inside and out. Part of that is because I have 15, and before I had 150. You just cannot get to personally know 150 kids. It's more like a factory operating line." What happens when you don't have the carrot and stick of grades, McMillion says, is that "you now have to concentrate on meaning: Why are we doing this? What does it mean? Why is it important?" Another way Khan's lab school is different: Older students serve as mentors to younger ones throughout the school day, not just occasionally. "We're all in the same environment. They look at us as role models," says 13-year-old Isra. "So that makes us feel like, 'Hey, we need to be polite, we need to be respectful.' "
But a key question is whether Khan's brick-and-mortar experiment will really help spread useful, scalable classroom insights and lessons, as Khan has vowed. Or whether it will simply become a great little independent school serving a small group of mostly wealthy Silicon Valley kids. "We don't want to start just another progressive school that caters to people in Silicon Valley," Khan insists. At times, the classroom looks like controlled chaos. But the emphasis on students taking charge, Sal Khan says, helps foster creativity and collaboration. "We want to create something that has to push the envelope, and then share that with the rest of the world. I never viewed technology as a replacement for the human experience. I viewed it as something that could liberate the human experience." His laboratory school is not-for-profit, like the virtual academy upstairs. But it is an exclusive, selective private school not at all like the Khan Academy slogan: "A Free World-Class Education for Anyone, Anywhere." Actually, Khan's lab school slogan could be "a world-class education for $25,000 a year for lucky Silicon Valley elites." Khan disputes that. He says the point is to boldly experiment with research-based instruction. And then share everything the lab school learns with educators everywhere. "Teachers are super overworked; even to have the space to think about re-engineering is hard," he explains "Then, to actually do it, what is the curriculum? 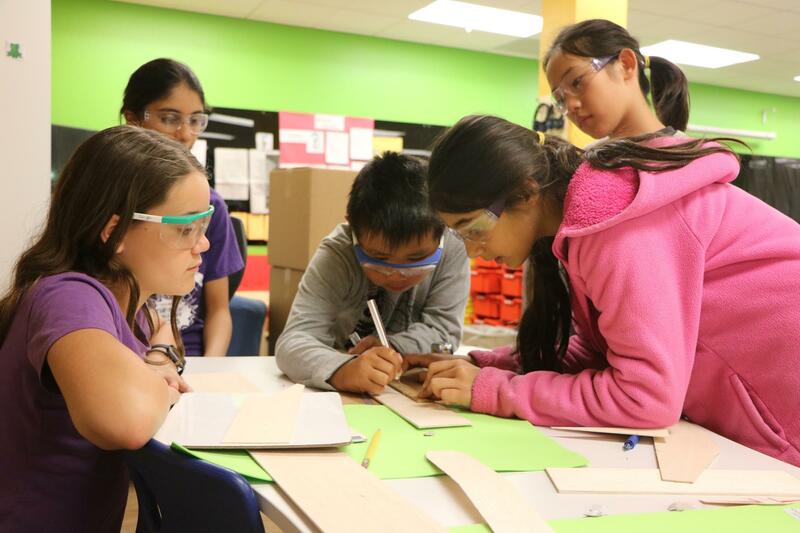 Everybody talks about project-based learning, but what are those projects?" Khan has no illusions that his lab experiment will solve longstanding K-12 challenges or find some pedagogic holy grail. "I've learned that certain things are much harder than when you write about them in a book. But we're also connecting with similarly minded educators at public schools, private schools, charter schools that cater to all sorts of different demographics, and learning together, and thinking together, 'How do we get more students to be able to experience personalized learning?' "
From earliest conception, he says, he and its founders saw the lab school as one thought-provoking experiment that could help catalyze change in the broader education ecosystem. "It's not going to be the lab school by itself. We're not delusional there," he says. Khan's big challenge will be to help spread the lessons of what works — as well as what doesn't — beyond the lucky five-dozen students at his Mountain View, Calif., experiment. Sal Khan, the founder of the Khan Academy, has helped hundreds of millions of people around the world learn math, science and other subjects, all for free, all on YouTube. But these days, if you walk down just a flight of stairs from his Silicon Valley office, there is a real school - a brick and mortar experiment that is very different from his online lectures. Eric Westervelt with the NPR Ed team reports. SAL KHAN: So the last couple of seminars, we've been talking about technologies that will potentially change the world. ERIC WESTERVELT, BYLINE: On Fridays, the lunch menu at the Khan Lab School in Mountain View, Calif., includes a Socratic dialogue with the founder and CEO himself. KHAN: We did self-driving cars. We've talked about virtual reality. We talked about life extension, robots. WESTERVELT: On a picnic table, a group of seventh and eighth graders eats their lunches while debating this week's seminar topic - the prospects and perils of artificial intelligence. UNIDENTIFIED STUDENT: How do you know that it'll listen to you? If it's a human brain, sometimes I don't listen when people tell me to do things. WESTERVELT: The discussion is quintessential Silicon Valley - self-referential and self-important, yet compelling, engaging and genuinely different. KHAN: You think intelligence and ego is correlated? UNIDENTIFIED STUDENT: If we eliminate all our bias and our ego - I mean, I have some ego (laughter). WESTERVELT: Just another lunch chat at Sal Khan's Lab School. The kindergarten-through-eighth-grade school currently serves 65 students. Inside, there's a big, open classroom. 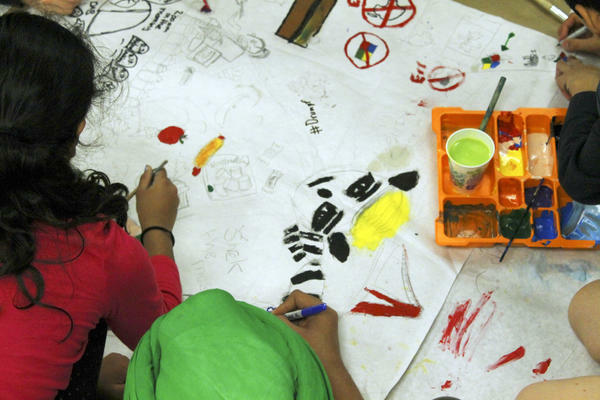 The school's ethos of playful inquiry gives it a Montessori-meets-Willy-Wonka feel. In one area, students talk politics while drawing flags and maps on a poster board. Elsewhere, students are rehearsing "Shrek," the play. UNIDENTIFIED STUDENTS: (Singing) Oh, what a lovely day. The sun's so big it hurts my eyes. UNIDENTIFIED WOMAN: (Singing) But really, that's OK.
WESTERVELT: A growing number of schools make personalized learning part of the curriculum. But the experiment here, in many ways, is how to make personalized learning into more than a nice slogan. GURSHAN JOLLY: I like it a lot, mainly because we get to take responsibility of what we want to do and where we want to dive deeper. WESTERVELT: That's student Gurshan Jolly. Students here are grouped not by age but by independence level. There are no grades and no grade levels or traditional homework. WESTERVELT: Gurshan is 10 years old. At times, the classroom looks like controlled chaos, but the emphasis on students taking charge, Sal Khan says, helps foster creativity and collaboration. KHAN: Look, we don't want to start just another progressive school that caters to people in Silicon Valley. We want to create something that has to push the envelope and then share that with the rest of the world. I never viewed technology as a replacement for the human experience. I viewed it as something that could liberate the human experience. WESTERVELT: Technology as a tool for liberation - it's a Silicon Valley ideal, but it's not clear Khan's Lab School, as yet, is helping reach for another ideal - narrowing the education equity gap between rich and poor, a prime motivation of his virtual Khan Academy when that launched a decade ago. His laboratory school is not for profit, like the virtual Khan Academy just upstairs. But it is an exclusive, highly selective private school, not like the Khan Academy slogan, a free, world-class education for anyone, anywhere. Actually, the Lab School's slogan could be, a world-class education for $25,000 a year for Silicon Valley elites. Khan disputes that. He says the point is to experiment and share everything with educators everywhere. KHAN: If there's a practice that we think is really powerful that's happening in the - in the physical, our designers and our engineers can start to say, well, can we create some version of that in the virtual? WESTERVELT: It's early yet. The school's barely two years old. But Khan is betting that the cross pollination of the virtual and the real proves fruitful. His challenge is to scale it, to spread what really works educationally beyond the 65 lucky students at his Lab School. Eric Westervelt, NPR News, Mountain View, Calif. Transcript provided by NPR, Copyright NPR.